Interview with Karan Singh aka "Loner with a Phone"
Let’s start the interview with something simple. Who are you? My name is Karan also known as “Loner with a Phone” on social media. Describe yourself a little more? Well, I am a vlogger who doesn’t use youtube. I own some blogs but I don’t write. I am also an entrepreneur who doesn’t like bragging about his own company. So inshort, you are someone who doesn’t like following rules? No, it’s not the case. I love disciplined life. Like I love it when I decide my workout or work or travel plans for a month and follow it the way it should be. I just don’t like the rules people have created for social creators. Like youtube is the place for vlogging, Instagram is for hot pictures of pretty girls or guys with abs. Snapchat is for D*** pictures. I think if you have talent no matter what platform you use, you are going to do good. Period. For those people who haven’t seen your content, please tell them what do you do and what do you consider your talent. As a social creator I would consider myself in storyteller zone where I love telling different stories about my life and with adding a little humor towards it. I share my daily life and all the major aspects of my life in stories. What about the part you don’t show on Social Media or don’t want to show on social media. Ummm…. There are a lot of those things as well, especially about my work life. Like I just tell people that I work hard but I will never use social media between meetings, dealings with worker etc. I try not to post whenever something is making me low. Also, I don’t think I would like to show dating life either (If I am dating). These are somethings, which are better when they are offline. Would like to share a little about your dating life or any recent crushes. Dating life? Nope. Crushes yeah. I woke up today morning and couldn’t take my eyes off myself in looking in the mirror. I think I am falling for myself. all the time. all over again. What will you do if tomorrow Snapchat closes down all of the sudden? I will go on instagram. If that closes down may be I will go on twitter or tumblr. Infact recently I have started concentrating more on other social media platforms as well. I have this belief that if I can make it huge on the software which is already a non viral platform and most of people either don’t understand how to use it or don’t like using it at all, then I will do okayish on other platforms as well. What are some dark sides of having a social creator life. There are lots. Like lots. One of them is that my close friends don’t like being on camera and some of them don’t want to get famous or share the their personal life online. Infact, I completely understand that as this is a sacrifice I have made to put my life and whatever I do on social media hence they shouldn’t suffer for that. Another one would be picking up camera on tough days or low days. Like smiling for camera to entertain others when you clearly want to be under your blanket. Any other advice for social media people who are planning to make it big? Yes, I have two. First, be yourself. I know you have heard this a thousand times but please for God sake stop trying to be Logan Paul, David Dobrik, Casey or anyone you are mad about. It worked for them because they were like that. You aren’t. You have to take a different path. Second would be my favorite one, which is, find the balance between the things you really want and thing you really enjoy and do both of them really hard. Like mine is to party, work, travel and workout. Those who follow me know that I do it all really hard. Great one, So where can our viewers find you. 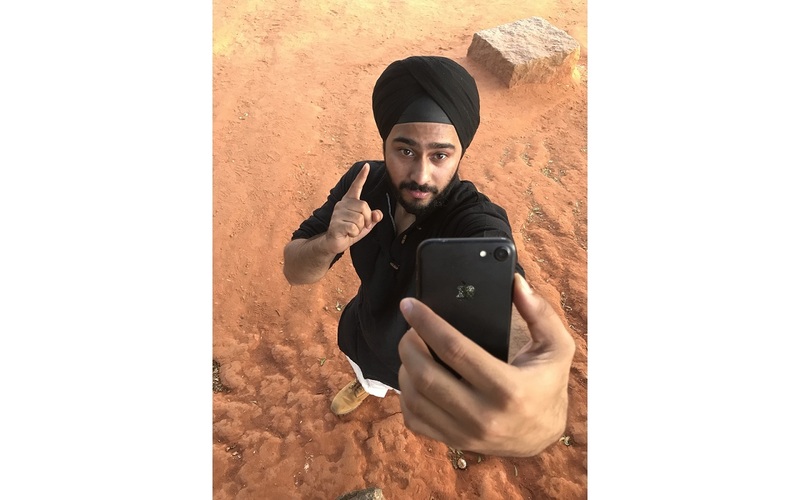 Or if you see a sikh guy in India talking to his phone camera, there is a good chance that’s me.